The Following review by William Gutierrez was published by the Williams Record on October 3, 2012. You can also find it on the Williams Record website here. Sterling Brown ’22 Visiting Professor of Music Avery Sharpe showcased his work on abolitionist Sojourner Truth in Brooks-Rogers. 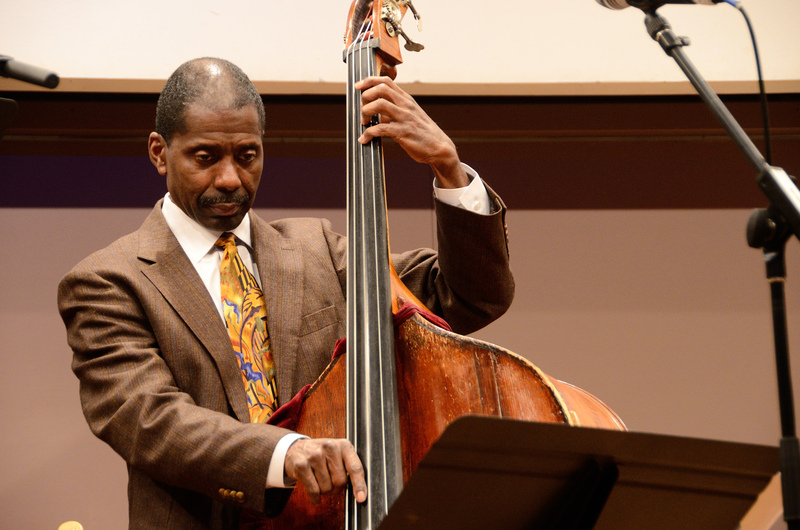 Last Friday, Brooks-Rogers Recital Hall was transformed into a swinging jazz club thanks to the efforts of Artist Associate in Jazz Bass Avery Sharpe and his sextet of musicians. However, this was no ordinary concert, as each song was inspired by the life and words of noted abolitionist and women’s rights advocate Sojourner Truth. Most of the music and lyrics were composed by Sharpe himself, adding to the personal nature of the show. Avery Sharpe is the Sterling Brown ’22 Distinguished Visiting Artist in Residence in Music; he also serves as the faculty advisor for the gospel choir. Having worked with some of the biggest names in jazz, from Wynton Marsales to Dizzy Gillespie, he brings extensive experience in working with students at institutions such as Bates and the University of Miami, and has already made a positive impact on the College community. This show consisted of selected works from his latest album, Avery Sharpe – Sojourner Truth – Ain’t I A Woman, and featured five other extremely talented jazz artists. In writing the music featured in this performance, Sharpe had clearly done extensive research on Truth’s life, with each song connecting to a specific moment or experience in her life with astonishing clarity and empathy. Assistant Professor of Africana Studies Rhon Manigault-Bryant opened the show with her own rendition of Truth’s iconic “Ain’t I A Woman” speech, and then proceeded to explain why Truth, as an abolitionist and suffragette, was so far ahead of her time. She wanted her “entire being to be celebrated,” and this idea of black feminism, or “intersectionality,” did not become a prominent movement until decades after Truth’s death. Manigault-Bryant then gave a brief introduction of Sharpe, explaining how he finds inspiration for his music from his ancestors and from the past in general. Sharpe and his band entered in silence, slowly and deliberately preparing their instruments for the performance ahead. Iconic and familiar images of enslaved Africans were projected onto a screen in the background. Suddenly, the band exploded into a song that was not on the program, perhaps even improvising in order to introduce the audience to the types of sounds that would be heard throughout the evening. Sharpe’s jazz bass, often given more of a background role in many songs, was featured prominently, both within the context of the song and with a long solo to showcase his skill. He knew his instrument well and could coax a variety of sounds from it without the need for intense thought. He strummed, plucked and even hit his bass as though it were a percussion instrument, lending it more than one voice at a time. The first song from the album that the band performed was “Motherless Child,” Sharpe’s rendition of a traditional slave song. Truth herself actually heard and wrote about this song and considered it especially powerful. Like many of the songs in this performance, the tempo seemed very fast and upbeat considering the weighty nature of the lyrics and subject matter. The brassy and rhythmic beats at first seemed downright incongruous with lyrics like, “Sometimes I feel like a motherless child / far away from home,” yet, the band managed to imbue a sense of soul and feeling into the song, from the intense crescendos to even the artists’ facial expressions. Continuing with the theme of children and motherhood, Sharpe and his band then played “Son of Mine,” based on how Truth sued her former owner for her son’s freedom, becoming the first black woman to win such a case against a white man. This song featured a slightly slower tempo, with heavy emphasis on the piano and bass and no saxophone or trumpet at all. In the background, heart-wrenching images of slave children were projected onto the screen. Their next song, “Isabella’s Awakening,” was especially powerful, as it reflected Truth’s decision to abandon her slave name of Isabella Bomefree and instead to take the name Sojourner Truth to reflect her newfound freedom. The upbeat nature of the song gave an impression of happiness and redemption: Scenes of religious awakening, such as Moses receiving the Ten Commandments, could be seen on screen in the background. This song gave the saxophonist, Jimmy Greene, a chance to shine, and the constant eye contact and laughter between the bandmates gave the audience a glimpse into a very personal familiarity. The closing number, “Ain’t I A Woman,” was nothing short of a transcendent experience. Sharpe changed to the electric bass for this song, which consisted of a dramatic reading of Truth’s famous speech set to beautiful music faintly reminiscent of gospel. Jeri Brown, the vocalist of Sharpe’s sextet, did not exactly sing the words of the speech, yet she instilled them with a sense of rhythm that imparted a unique poetry to the song. The sextet finished to a standing ovation, and after some begging, they even agreed to play a brief encore, choosing a song called “Pleading for My People,” the lyrics of which were actually written by Truth herself. The entire experience was extremely powerful, and showed that even the smallest of performances at the College can have a big impact.